*Approx. final choice is up to your personal preferences. Between sizes? Size up for long upper body/legs, higher handlebars/longer bike. Size down for short upper body, more aggressive/ lower bars. The hottest trend in the mountain biking world right now. Fat bikes are hard to miss. Their giant, “fat” tires roll over virtually anything, which makes them an ideal winter mode of transportation. 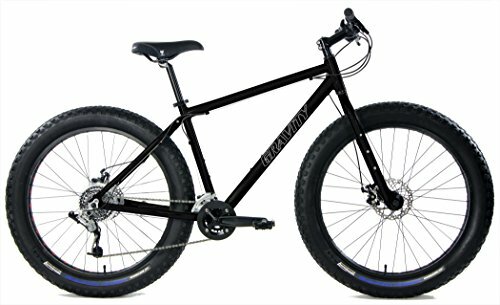 FAT BIKES! Ingeniously simple concept. Giant tires = more control in loose conditions. Super wide tires “float” over snow and sand…the fastest bikes you’ll ever ride on mud, bogs, deep sand and snow. As a bonus, they’re super smile-generators. How much does it weigh? These are big and Big FUN. Big weighs more. Powerful Tektro Disc brakes front and rear! High Traction Super Wide 26 x 4.0 Tires, Ride Nearly Anywhere!